Brendan Baker + Briana Breen take home the Director’s Choice award. Producer Briana Breen, along with L+R’s own Brendan Baker, took home the 2015 Third Coast International Audio Festival Director’s Choice Award for The Living Room. This is L+R’s second Third Coast win, after we became the first podcast to win Best Documentary in 2011, and picked up an Honorable Mention in 2013. 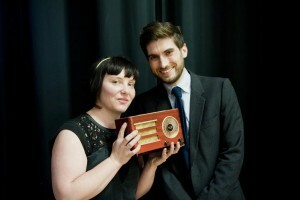 Fellow Radiotopia podcasts 99% Invisible (Best Documentary: Bronze) and Criminal (Best Documentary: Honorable Mention) took home radio-shaped awards. View all the winners from the 2015 Third Coast Fest.